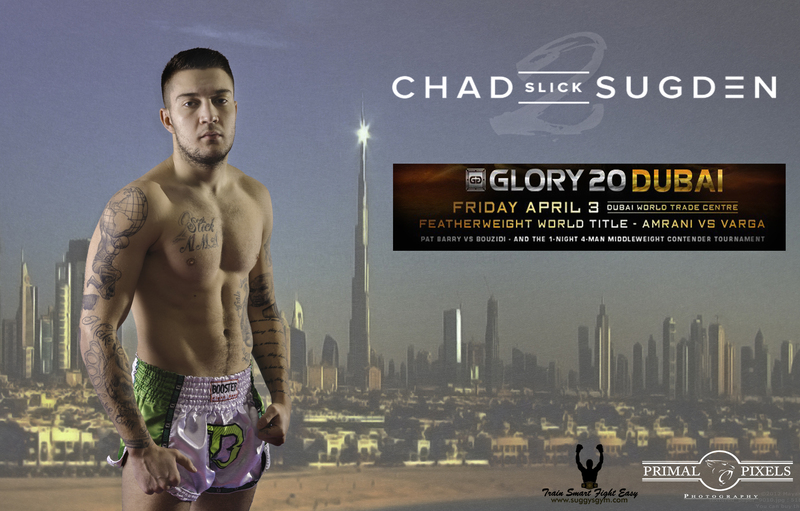 Chad ‘2 Slick’ Sugden will be back on the road to glory on Friday 3 April, when he takes on Atakan Arslan on the card of GLORY 20. The Suggy’s Gym fighter had his first taste of GLORY in March 2013, defeating Sam Wilson when the promotion came to the Excel Arena in London. Now he will be heading to Dubai for a 77kg Superfight against his Turkish opponent. “This is a really exciting opportunity for me,” said Chad. “Not only do I get to visit Dubai for the first time but I’ll be going there to take part in one of the GLORY shows, which are renowned for promoting match ups between some of the world’s top fighters. Head coach Dean Sugden added: “Chad has matured massively as a fighter since his first GLORY victory. Over the past year, he’s proved just how much his skills have developed fighting under the K-1 Global banner and we’re grateful to them for allowing us to take advantage of this fantastic opportunity to showcase those skills on the Glory stage. “After making his pro debut at 76kg when he was just 17 years old, he’s struggled to make 70-72kg. He’s done pretty well though and is currently UK Number 1 at 70kg and both ISKA World Champion and Intercontinental Champion at 72.5kg.